German Translation of ACIM oe has begun! Adobe PDF of Fhe first 2 Chapters of the GERMAN translation Ur-Compendium please click here. (Step1). Posted in ACIM ARTICLES, EVENTS, TRANSLATIONS of OrEd. Tags: A-Course-in-Miracles, ACIM, acim music, ACIM [Original-Edition], Bill Thetford, Celestial-Speedup, Course in Miracles Society, Forgiveness, Helen Schucman, Jesus, Martin Weber-Caspers, Miracles, Ur, UTUR, William Thetford. Comments Off on German Translation of ACIM oe has begun! Bill Thetford [co-scribe of A Course in Miracles] died on July 4, 1988. On that day, not long before he collapsed of a heart attack, he had announced to his close friend Judy Skutch Whitson that it was Independence Day and finally he himself felt free. “By the time of his death in 1988 at age 65, Bill Thetford had practiced these lessons to perfection, leaving this world of time and space free of guilt and grievances. As his time on earth grew to an end he was able to release all that held him back from true peace. Would that we could all reach that goal.” Excerpt from review by Alice T. Mac Mahon of “Never Forget to Laugh” written by Carol Howe. On the occasion of the 22nd anniversary of Bill Thetford’s passing, it seems timely to offer you the third in a series of extra material not found in his biography, Never Forget To Laugh. For those of you who have not read his amazing story, Bill pronounced ahead of time that he would declare his independence of the Fourth of July, and he did – July 4, 1988. Enjoy! “Apparently, Bill, from beyond the veil, still has some things to say to those who choose to listen, either through waking experience or in dreams. Visiting in Hawaii at the time of Bill’s passing, Jack and Layle Luckett were on their way to a friend’s birthday party when they were given the news. Their informant started to choke up on telling them and Jack said, “Don’t go into fear. Be joyful. This is a wonderful moment!” although he wasn’t sure how it was going to be returning to their La Jolla apartment without Bill. (Bill and the Lucketts shared a condo at that time.) However, knowing they would tell the assembled group about his passing at the appropriate time and that many strong feelings would be evoked, Jack said, “I was led to a reading from A Course In Miracles and told the group, ‘Hold hands, as I have some wonderful news for you.’” The reading that came to him was from Lesson 253, My Self is ruler of the universe – “It is impossible that anything should come to me unbidden by myself. Even in this world, it is I who rule my destiny. What happens is what I desire. What does not occur is what I do not want to happen . . ..” Jack knew it was perfect and felt Bill had given him the lesson to read. Layle added, “Right after he left—I think it might have been the next day—he spoke inside me and I really felt it. He said, ‘Tell everybody in the Course in Miracles groups to tune into me, that I am available to them and will bring whatever visits, messages, confirmations, verifications – whatever it is they need.’” Layle shared this message with a woman in Australia who said she had been looking for a place to live and wondered if that might be “too dumb” a request for Bill. Layle suggested she ask him, which she did, and the woman recounted, “He came to me in my dream and told me where to look, what to do, how to say it, and everything else.” The next day she found her place to live. Although a dream, it says it all and it is literally true that anyone, whether they knew him personally or not, can still call on him for help. Seems like all the world could use a little of that Bill Thetford warmth, irrepressible sense of humor, and acceptance. And the way for us to experience those blessings is to offer them. 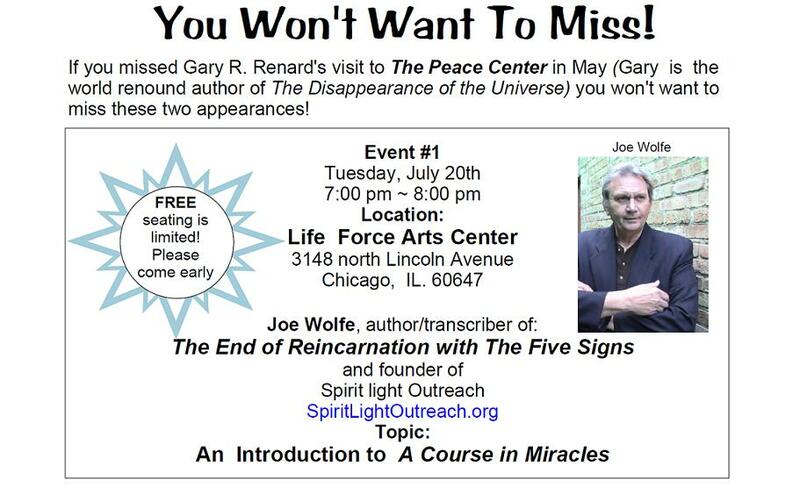 Tuesday, July 20th 7:00 ~ 8:00 pm Begins Promptly. Free seating is limited: Come Early! 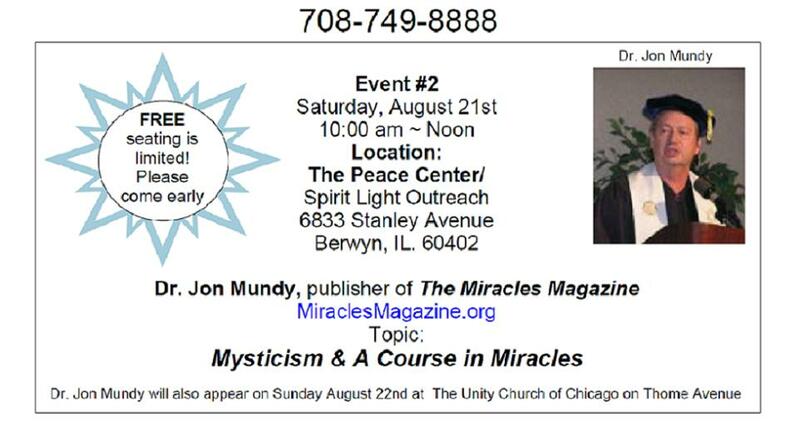 Universe and Jon Mundy, publisher of The Miracles Magazine. 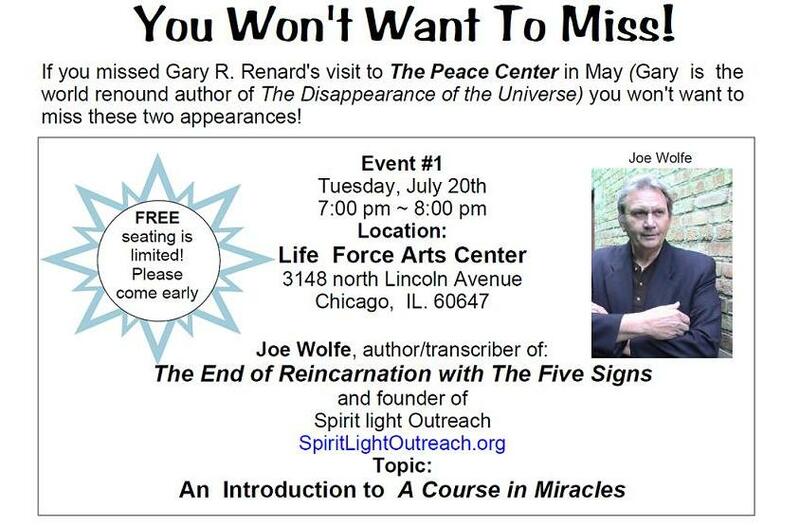 ACIM gathering at The Peace Center in Berwyn, Illinois. twelve step recovery programs and to the physically challenged. spiritual discipline and how that discipline would lead to real Love, Light and Peace. what is commonly referred to as an out-of-body experience. He’ll detail the events that changed him from a career criminal to a seeker of the Truth. the account of an experience of inner Light that dwarfed the sun by comparison. Peace never proceeds from victory. There is something attractive about raw human courage, valor, the willingness to do the “right thing” in the face of seemingly insurmountable odds. Surely Spirit would approve of this activity. Surely this selfless sacrificial effort would earn merit!? The legendary St. George slain the dragons that persecuted and devoured countless worthy souls. Surely his model would inspire worthwhile emulation? Not so! St. George of “The Dragon” fame teaches the wrong message. What is taught as “courage” to slay the dragons does not lead to the underlying real objective of Peace. Peace doesn’t come from the violent slaying of the dragons in the pit. 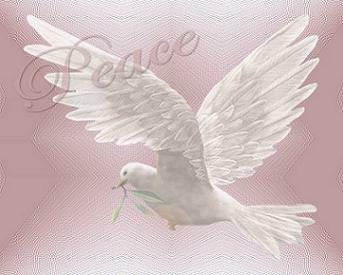 Peace never proceeds from victory. Only conquest, subjugation and resentment proceeds from victory. The pursuit of victory is one of the chief distracters preventing mankind’s discovery of true peace. Peace only comes from Peace. Peace comes from releasing all impulse toward conflict. The only way to achieve escape from oppression is surrender. What we call “oppression” is the forced (violent?) control/manipulation of the behavior of another. To stop that event, one must somehow simply stop it. One does not stop it by mounting a countervailing or contrary oppressive attempt. Such coercion is either unsuccessful, creating great misery, or successful, creating continuing oppression of another color. Peace comes from peace. Peace comes from releasing all impulse for conflict. Thus, the only way to “win” is to accept, not to attack in (self-) righteous anger. If peace is the objective, it is always available. It is always as near as the refusal to attack. At this point in the discussion, my ego sounds like a motorboat: “but, but, but, but”. Still, it is a truism that “peace can arise only when conflict is abjured”. Are we perhaps really seeking something other than peace? But, even if accomplished, foregoing the ego’s impulse toward (violent?) counter-attack is only an elementary learning. It’s relatively easy to understand how self-defeating and counter-productive attack truly is. The crafty ego may lose that first round easily, but it is not yet finished. It has a bag full of “compromise” positions to try out, any one of which might hook your belief. One of the ego’s early attempts at compromise is: “I will surrender when I am sure it is appropriate, but first a careful analysis of the situation is required.” It seems important to judge who is correct, who at fault, who should be the proper authority, whose will is the more beneficent, more helpful. Analysis will not lead to peace either. Analysis, being an ego-based judgmental undertaking will not even lead to real understanding. At best, careful analysis may generate a “position”, a posture, a more coherent bias with which to derail any hope for true forgiveness. The ego says, “I’m not attacking anyone (right now), I just know who/what is Right!” From this more hardened, committed position, the ego can prevent “forgiveness” (i.e. overlooking what never occurred) for a long, long time. The ego is insulted upon each occasion that you affirm: “I do not know the thing I am. I do not understand what is really happening here and I have no basis upon which to judge this situation. This is only a variation on the Course’s statement: “behold me brother, at your hand I die.” This posture can even seem (deceptively) holy. It certainly seems to be passive enough! Can there be real virtue in passivity? Mahatma Gandhi would say not! His discipline of non-violence was never passive. His entire nation-wielding strategy was based on relentless confrontation with the evils and excesses of the Colonial power. He was always ready to challenge arrogance or stupidity, by insisting that it be carried to its logical conclusion, but never by violent opposition. It was the same tactic in social terms that the Japanese martial arts employ. Artfully yield to the aggressor, using the aggressor’s own energy to accomplish his defeat. I suggest that we’re not being counseled by The Course to be passive. We are being counseled to be totally courageous. Real courage is relentlessly, actively forgiving. Real courage is to stand up in the trenches and say, “can we talk?” Real courage is to go outside, sit on the gun-barrel of the menacing tank and talk. Peace is not for wimps. It takes guts. It takes consummate courage to face what appears to be great threat and offer only forgiveness. Love is the sole alternative to fear, whatever the ego may insist. To escape fear, the only path is to embrace love. Peace is the natural and inevitable fruit of Love. The embracing of love leads as certainly to peace as peace leads to glory. Only “cowards” like the ego could attempt to find peace through victory. *In 1976 Kellie Love began, independently, to record the ACIM text as a personal discipline to aid in learning the material. With encouragement from the Foundation for Inner Peace, he finally completed this home-brew recording in 1982. It was judged promising but not technically adequate for publication, and he was commissioned by the Foundation for Inner Peace to spend 6 weeks in a commercial studio recording the definitive version of ACIM. This was published and the cassettes were distributed by the Foundation and Earl Nightengale Press for many years. It was still dark when Gaff got to his spot on the beach. He pulled his wagon down on the sand and put out his chair in time to see the spectacle that marked the boundary between night and day: the sunrise. First, there was a finger of gold making its way onto the horizon from somewhere on the other side of the planet. More fingers joined the first, encroaching farther along the horizon and up. It was as if the sun were pulling herself into the morning sky with those fiery fingers. Then there was the sun itself. As the brilliant golden orb rose up over the clouds on the horizon, he talked to Mother Water. He pulled the pirate flag from the wagon and unfurled it. 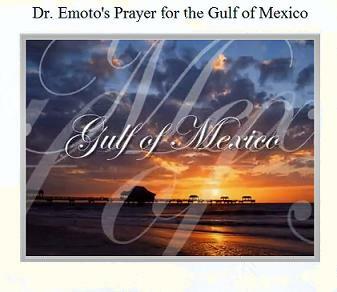 It started a gentle flapping in the light breeze even as he planted it in the sand near his chair. He turned back to the sunrise. “Like the gargoyles, this skull and crossed leg bones is a symbol of protection. Protection from what, Mother Water? I’m beginning to think we need protection from ourselves more than from any other threat on the planet in the Universe. WE are the threat. “While people argue about what is real or unreal, they miss the point of all of this, don’t they? I awoke this morning feeling that I was a part of something huge, something more than my body or my life or even this planet. What is real is the loving energy of this Universe that supports us all. At least, that’s what feels real to me. The old fisherman of Kure Beach sat for a time, absorbed in the beauty of the moment. Still watching, he stood to walk to the waves lapping gently on the sand. He put his bare feet into the water with the same reverence due a baptismal font. “I am not worthy to receive you, but only say the word and I shall be healed.” These words from his days in the church skipped through his mind like the refrain to a familiar song as he bathed in the water of Mother Earth. The refrain continued as he bathed in the beauty of the sun rising over the clouds on the horizon. The clouds looked like trees on a piece of land somewhere far out in the ocean. Is that what all this is? An illusion of reality that allows us to demonstrate the love that heals? An illusion like those clouds that look like land? The healing of love like the golden rays of the sun that covers those clouds, eventually creating enough heat to make them disappear? Then he returned his gaze to the streaks of gold coloring the sky over the ocean. He shook his head in the awe of it all. He felt the love that surrounded him, that healed him, that gave him the strength to meet the challenges of each day. This is real: this is LOVE. *Lorena Peter, Ph.D., writes entertaining mysteries, romances and wisdom books. All have strong spiritual underpinnings and paranormal elements. She blends a medical intuition and healing practice (and travel) with her writing. For more information go to WWW.LORENAPETER.COM. There you will see photographs of locations discussed in Gaff as well as a chapter for your perusal. You may contact her on Facebook. For her understanding of the Course, she thanks Carmen Cameron and the class in Louisville, KY.